What If the video you shot is voiceless or having no sound? Learn about how fix videos that you shot that are voiceless or doesn't have any sound. 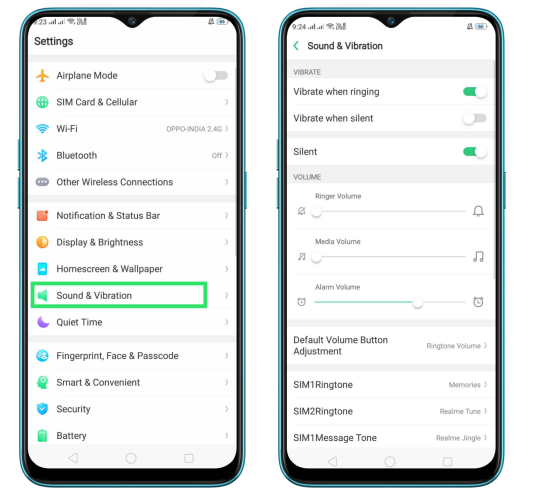 For ColorOS 5.2 and above: Go to [Settings] > [Sound & Vibration] > [Media Volume] to set the volume at maximum. *Make sure that the [Media Volume] of your device is set on high before you shoot videos. Make a sound recording with Sound Recorder. Play a sound recording made with [Sound Recorder] in [Tools]. If it is still voiceless, it is probably that the microphone of your device is damaged. Take your phone, proof of purchase and warranty card to visit a nearby Realme Service Center for more help. * Do not block the microphone at the bottom of the device when you recorded.